Meissen “Eichhornchen” patter circular tureen and cover mounted in early Louis XVI ormolu as a centerpiece. 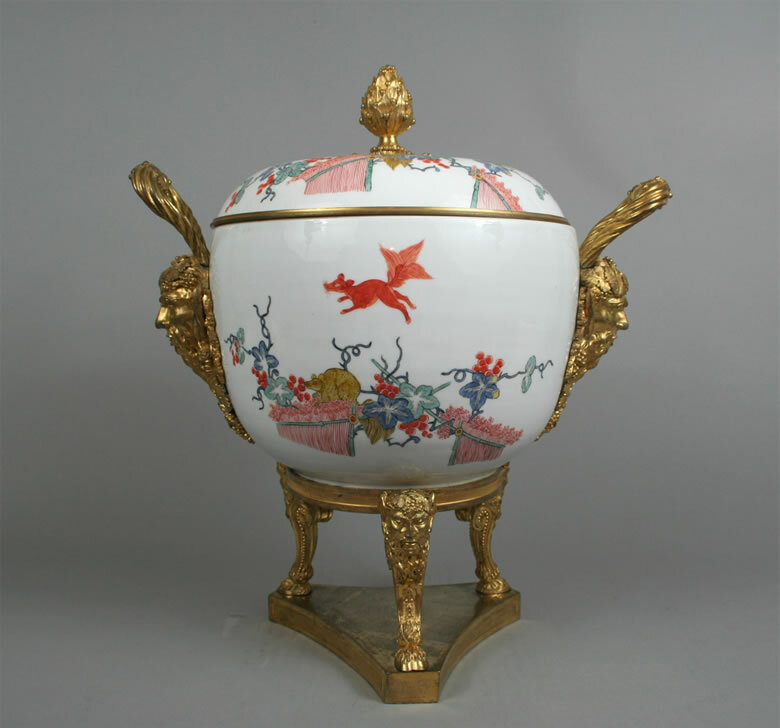 The Porcelain circa 1735, painted on the front and reverse of the tureen(handles removed) and across the cover(rim reduced) in a kakiemon palette of iron-red, blue, turquoise, yellow and black with a “flying fox” above a squirrel nibbling grapes from a vine traversing two bamboo-bound hedges. Mounted with two bacchic satyrs masks and loop handles. The cover mounted with an ormolu bud and leaf knop, the rim with a plain ormolu border. The footrim is mounted in ormolu with a reeded circular surround supported on three satyrs mask and hooved legs above a triangular base. The Walters art Gallery, “European Pottery and Porcelain of the XVIII century from Maryland private collections” Baltimore, Maryland June 4 thru October 16th, 1948. The Baltimore Museum of Art, anonymous loan, June 24, 1965 to October 2, 1969.